A colleague recounted an amazing experience she had at the Delhi Airport a few days back. She had just flown in and was waiting for her car. There is this small stretch at the Delhi airport that you need to cross from the covered porch of the terminal, to the waiting-car-lanes. While the stretch is small, its easy to get soaked if its raining. There were young boys holding huge family-umbrellas trying to help people save themselves from the rains. The umbrellas were branded with HDFC Life logos and these enthusiastic boys were helping passengers reach their cabs/cars without getting drenched. 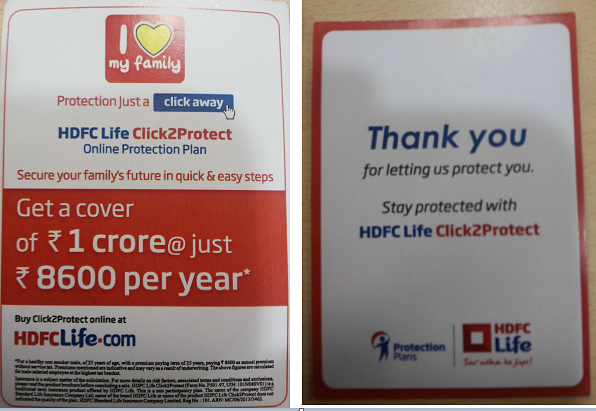 And while they walked with you to your waiting car, they would very politely hand over a small HDFC Life card (images attached) which promotes their Click2Protect – Online Term Plans. Its a very relevant offline activity. Most of us do not carry umbrellas and do get drenched a little bit if its raining. Insurance industry has been using the umbrella to highlight protection for years now. I can remember seeing way too many things under that umbrella – from house to family. But finally someone has made a meaningful and relevant use of the most recognized prop of the Insurance Sector. Its probably one of the best Offline-to-Online campaigns that I have seen so far. They have chosen a simple product category to share – Term Plans. A product category that has been witnessing the biggest rush for customer-initiated-online-purchases.